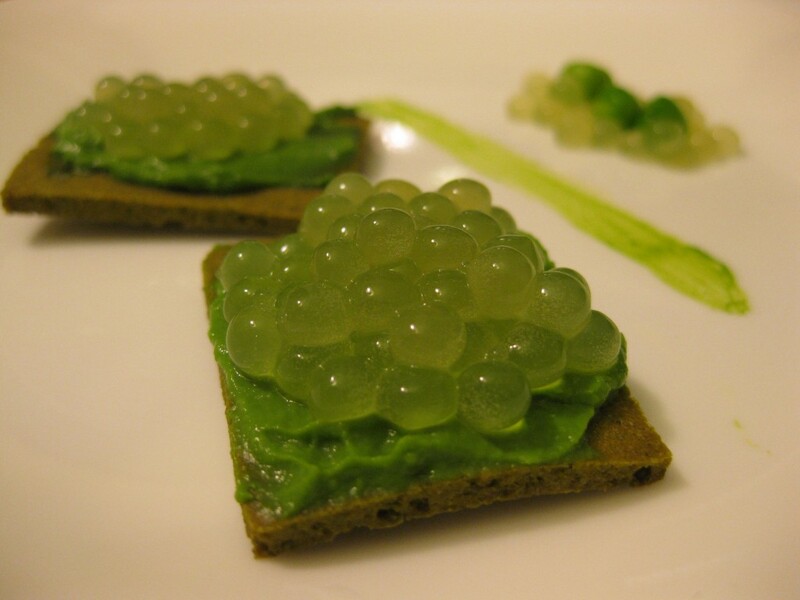 The Peaness Mightier: Pea butter spread on pea flour crackers, topped with pea water caviar. This dish is named after the SNL Celebrity Jeopardy sketch. I deconstructed a pea and put it back together to mimic the way caviar is served with crackers and lightly buttered toast points. Like a Native American uses every part of the buffalo, I use every part of the pea in this dish – nothing is wasted. 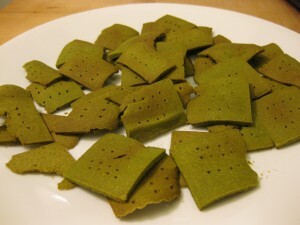 Seattlefoodgeek had a similar idea, but went in a different direction to make pea butter ravioli. 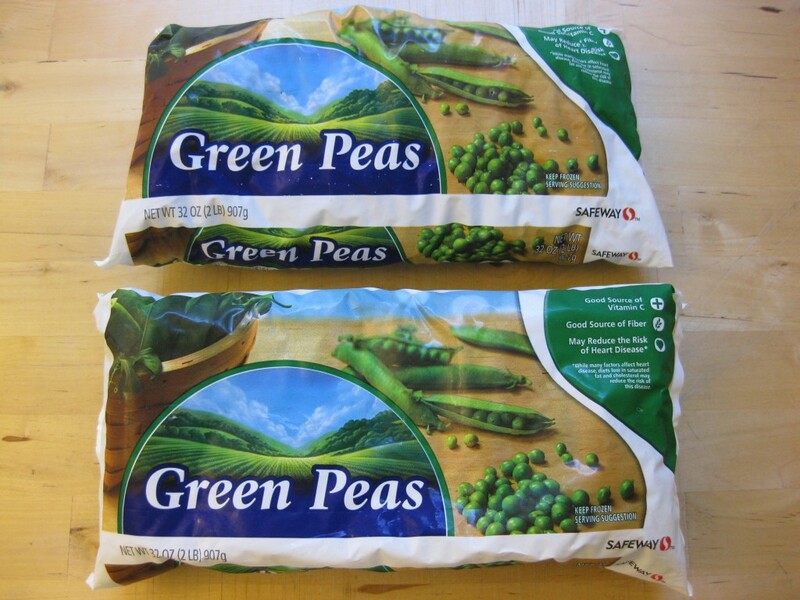 First, start with two two-pound bags of frozen peas (mine are Safeway brand). Let them thaw and then puree them in a blender. I pulsed the peas for a bit in a Blendtec and then blended for one 50 second cycle at speed level 10. After you’ve pureed the peas, put them in a centrifuge. I centrifuged the peas in a Beckman TJ-6 for 3 hours at 1500 G. You may have to experiment with your own centrifuge to find the right settings. 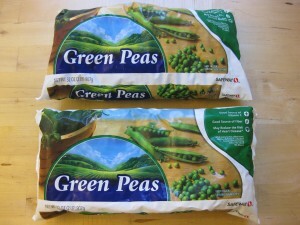 The peas will look something like this after centrifuging. The pea puree has separated into three layers: a layer of pea water on top, a thin layer of pea fat (the pea butter) in the middle, and a layer of pea solids at the bottom. Pour off the water and reserve it for later. Carefully scrape the pea butter off of the pea solids. Pea butter is smooth and creamy. Reserve the pea butter for later. 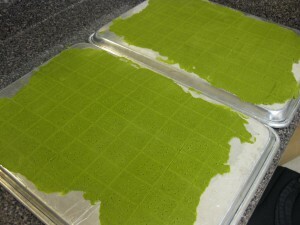 Next, scoop out the pea solids and dehydrate them. I spread the solids out on two trays and put them in the oven overnight at 180 deg F. Take the dried-out pea solids and pulverize them into a powder in a blender. 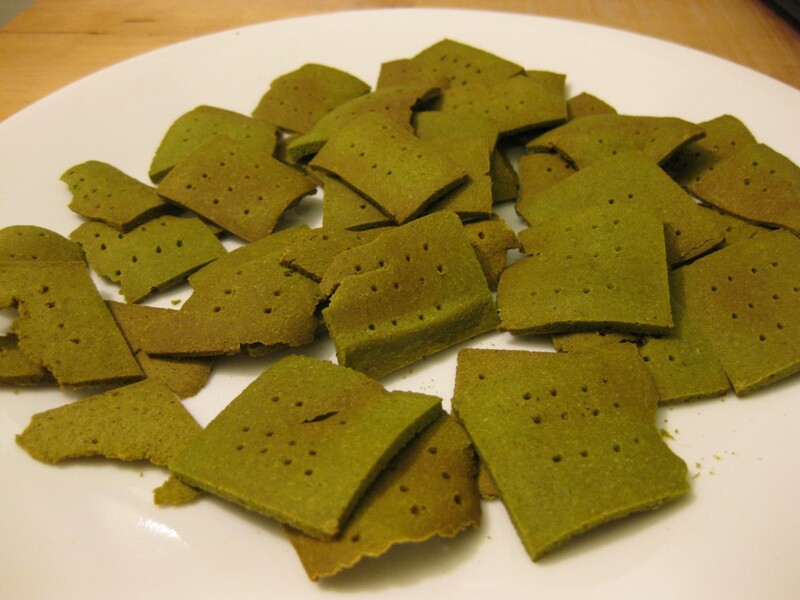 In a Blendtec, one 50 second cycle at speed level 10 should be sufficient to create pea flour. I started with 4 lbs of frozen peas. 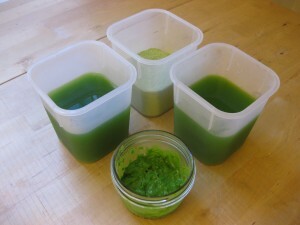 A pea yields 3% fat, so my 58 g yield of pea butter is perfect. Let’s make the pea crackers. I adapted this cracker recipe and substituted one cup of pea flour for one cup of regular flour. Sorry, I forgot to weigh my cups so I haven’t converted this recipe from volume to weight measurements yet. Preheat oven to 150 C/ 300 F.
Slowly mix in enough milk to form a soft, but not sticky, dough. Crackers are done. Next up, let’s make the pea caviar using basic spherification. 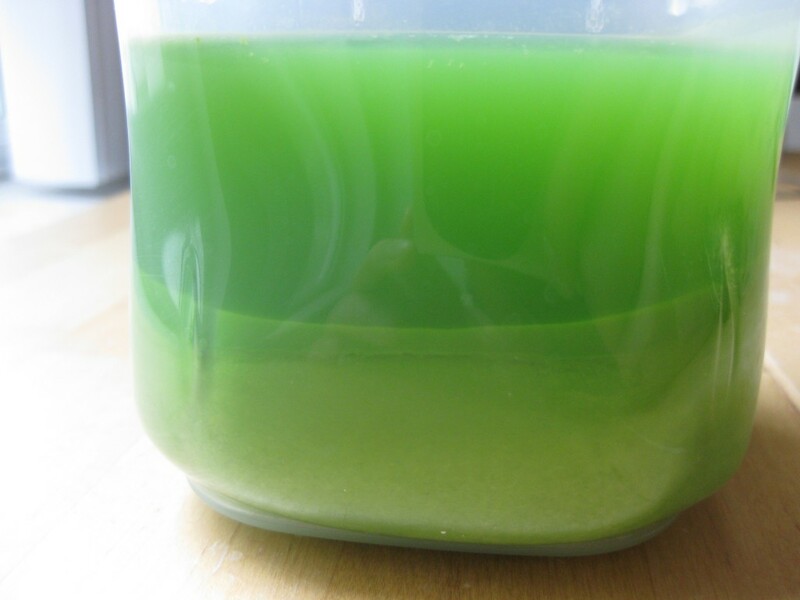 Mix the pea water and sodium alginate together using an immersion blender. Make sure the sodium alginate is fully dissolved – this can take some time. Run the mixture through a sieve a few times to remove the largest air bubbles and then set it aside to let the smaller bubbles dissipate while you make to calcium bath. Mix the water and calcium chloride together to create a calcium bath. Calcium chloride dissolves easily, so you can stir it together using a spoon. Set aside another 500 g of water to rinse the spheres after they’ve been taken out of the calcium bath. 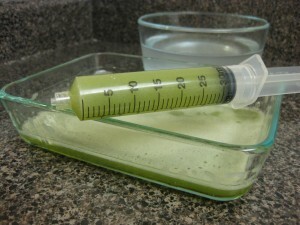 Load the pea water/sodium alginate into a 30 ml syringe and expunge it drop by drop into the calcium bath. Let the spheres sit in the bath for about a minute. You can experiment with the time depending on how thick you want the sphere walls to be. Take the spheres out of the calcium bath and rinse them in the clean water. Thirty ml makes a lot of caviar. 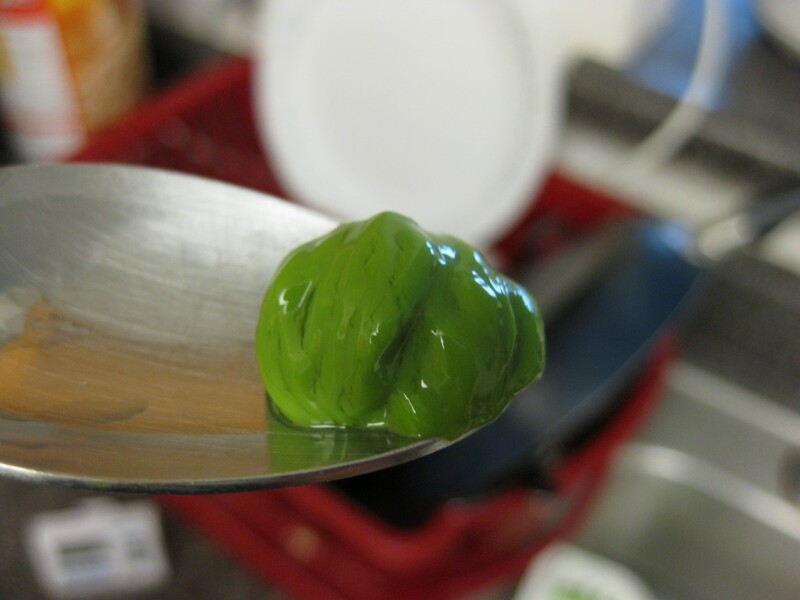 Since this is basic spherification, the spheres will continue to gel after they are removed from the calcium bath. Plate and serve immediately! Spread pea butter on the pea crackers and top it with the pea caviar. Garnish with caviar and whole peas. There is an episode in Man vs. Wild where Bear Grylls is fortunate enough to catch a rock lobster. His expression after he bites into the lobster tail is the same expression I had when I tried this for the first time. Wow!If you’ve had pea butter before, then you know it is the platonic ideal of what a pea should taste like. 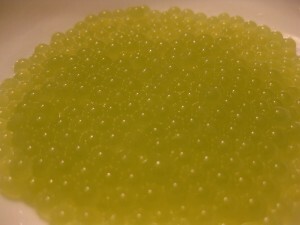 The toasty crunch of the pea crackers and the bursting pea water caviar magnifies the flavor of the pea butter even more! It’s simply…. heaven.